Company Overview - Cangzhou Zhongtuo International Trade Co., Ltd.
5YRSCangzhou Zhongtuo International Trade Co., Ltd.
Cangzhou ZHONGTUO cold roll forming machinery is a professional manufacturer and exporter that are concerned with the design, development and production of cold roll forming machines, material of machines and organic silicone sealants. The company cooperates with several production factories and associated enterprises. It is located in northwest of CangZhou, as a long history and it is the hometown of martial arts. 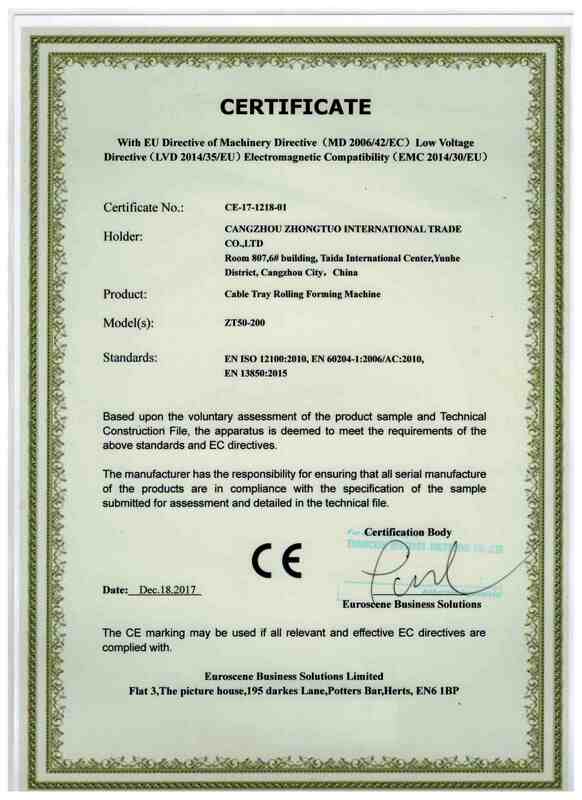 All products comply with international quality standards and are greatly appreciated in variety of different markets throughout the world, such as Asia, Africa, Europe, South America, and Australia and so on. It has gained a global sales network. 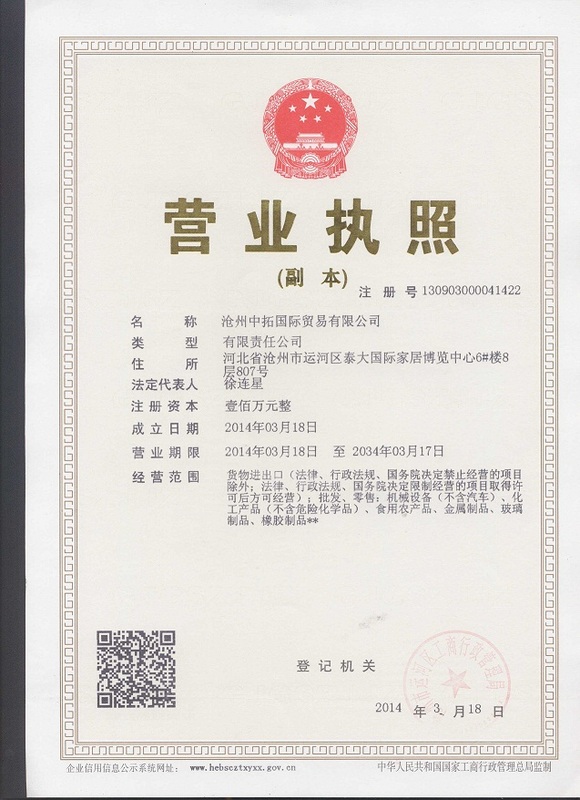 ZHONGTUO has passed several professional certifications, which are safety protection system certificate, environmental protection and energy saving system certificate, and other quality certificate and honorary certificate.The company is specialized in manufacturing Color steel forming machinery, C and Z purling machine, Glazed tile forming machine, steel structural floor panel roll forming machine, sandwich panel roll forming machine, highway guardrail forming machine, downspout forming machine, car panel roll forming machine, roll shutter door roll forming machine, sheet slitting equipment, and other equipment accessories.The company in order to : think what the customer think, do what customer worried , it provided high quality of colored steel roll, galvanized coil, aluminum plating zinc volume and other materials. Furthermore, it also provides the wide type of glazed tile, roof tile, and wall tiles.ZHONGTUO always adhere to technological innovation as the core competition. ZHONGTUO has high-quality scientific research team who are foreign experts and professors. They have obtained prominent achievement in research of high grade of organic silicone. The product is widely used in curtain wall, indoor decoration and other industries and fields, the products have excellent weather resistance and load displacement ability.ZHONGTUO is not only providing high quality products, but also provide excellent technological service. For a long period, ZHONGTUO adhere to: Dedication, Unity, Innovation, Win-win situation, as spirit of enterprise. It is in accordance with "high quality guaranteed, attach importance to reputation", provide customer to design and exploit of products, producing and install, training and debugging, and after sales service. The company is looking forward to forming successful business relationships with new clients around the world in the near future. Export and import of goods;wholesale and retail goods; machinery and equipments (not including cars), chemicals (not including dangerous chemicals), agricultural products for eating, metal products, glassware, rubber products and etc.